"A room with a view..."
Charming 3-star hotel, at the core of Strasbourg, opposite the Cathedral and Maison Kammerzell, the heart of the Christmas market, of the restaurants and shops, close to museums and canals of Petite France. Our hotel is ideally situated in the square overlooking Notre Dame Cathedral hotel and you will be staying in the heart of the historical center of Strasbourg. Whether you are here for business, relaxation, a romantic weekend away or a family trip you’ll be ideally situated to take advantage of artistic, cultural and economic events of the city. Each guest room has its own unique ambiance : always with comfortable beds, a warm atmosphere and original decoration. Whether you are looking for a room overlooking the Cathedral, a Renaissance yard, an attic room with exposed beams or a duplex for your whole family, we’ve got everything you need. You’ll be staying opposite the Cathedral and the Christmas Market, only a few minutes away from museums, from the Palais des Rohan and the Opera. You can walk along the canals of Petite France, check out local shops and will discover delicious Alsatian food in one of Strasbourg’s many restaurants. By tram you are just minutes away from the business centre and the European centre. 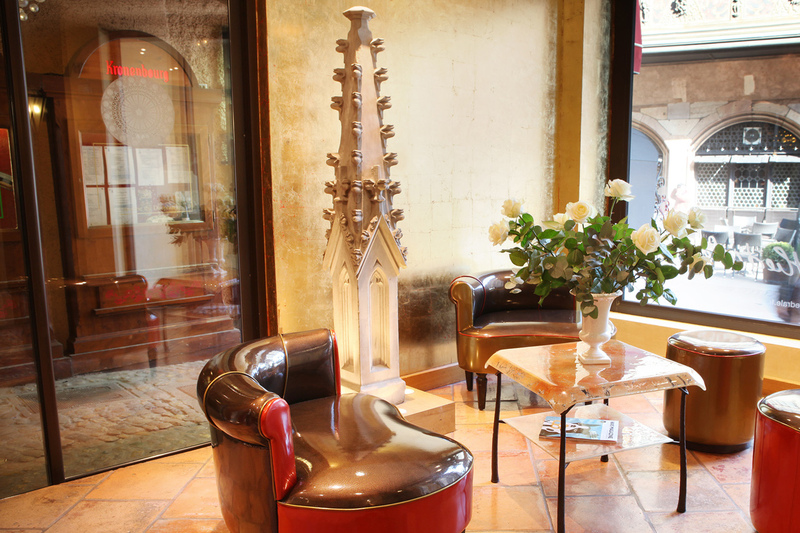 In fact, no matter where you go in Strasbourg, you are never far from the safe and comfortable world of the Cathedral Hotel. At the arrival of the beautiful days, the whole team of the Hotel Cathedral, Monika, Kseniia, Valerian and Christophe welcome you with a little spring spirit on the other side of this screen. They will have the great pleasure to welcome you and make you discover our new rooms cocooning, romantic, completely renovated, on one of the most beautiful squares of Europe, face to face with the Cathedral. Whether you choose a room with a view of the Cathedral or the Renaissance courtyard, you will experience privileged moments in a unique place, laureate of the design contest. Some personalities and VIPs have left us many friendly messages to the guestbook, which we invite you to discover.